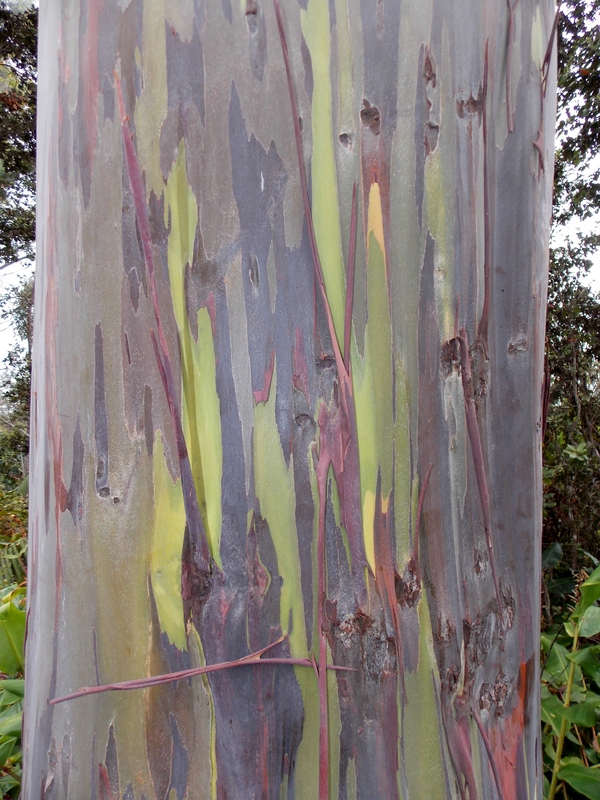 If not for my friend Jessica, I wouldn’t have known about the Rainbow Eucalyptus tree, let alone seen one. “What do you want from Hawaii?” I’d asked. “I want a rainbow tree,” she said and sent me a link to website photos. However, the photos mentioned Maui and I was on Hawaii Island. More research. I finally found a rainbow tree in the website for Cloud Forest Sanctuary above Kahlua-Kona (click for a map – Kailua-Kona on the left where the point juts out), high in an area I’d never visited. I’d lived in Hawaii and traveled the Saddle Road crossing the mountain ridge, but that road missed where I needed to go. Not far from the airport, Cloud Forest Sanctuary promised. I knew the airport, lying along the coast in a wide and very old lava bed. How hard could it be? But no one I knew in Hawaii knew about rainbow trees. I asked Robert, my brother-in-law. He didn’t know. 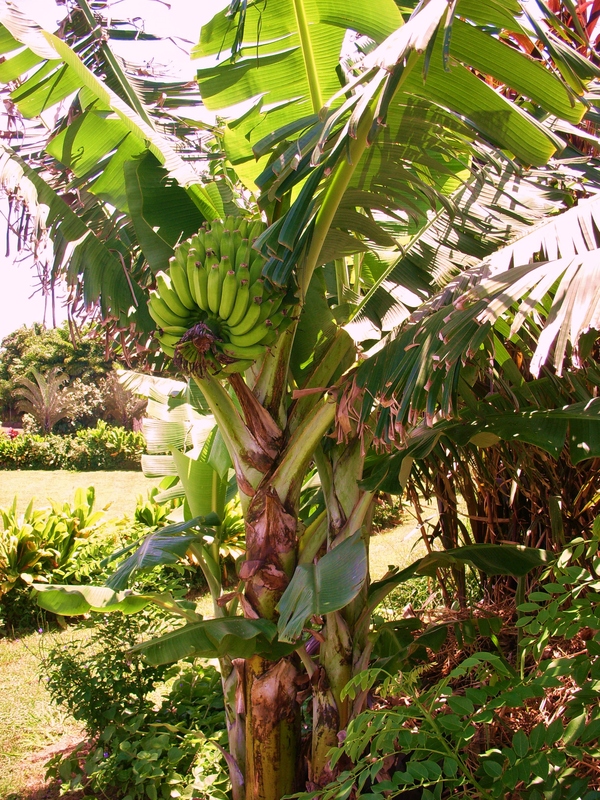 He plants trees that produce food: papaya, avocado, mango, oranges, lemons, bananas. And palms. He likes palms, all kinds of palm trees. 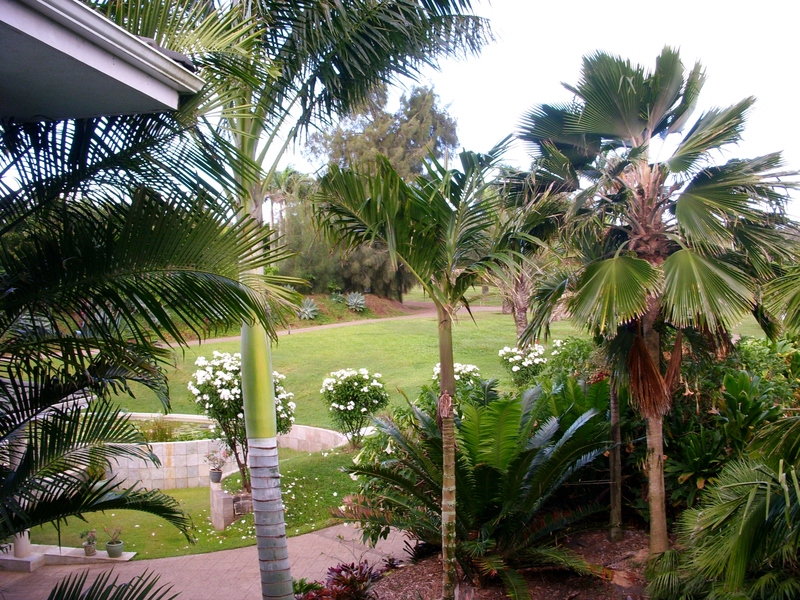 Tall Royal Palms line the long driveway to the lodge. I asked the other Robert, brother’s side-kick, who was born on the island. He’d never heard of them. But that’s not unusual. People born in North Kohala stay in North Kohala. They might go shopping down in Kona where there’s a new Costco, but they don’t stray far. Back to research. I found the address, Kaloko Drive, and plotted it on my trusty Samsung. All I had to do was find the left hand turn onto Kaiminani Drive, just past the airport road, to where it stopped at Mamalahoa Highway, take another right, and find the left turn to Kaloko Drive and the switchback drive up the mountain in search of the elusive Rainbow. Simple. Right? Well. I made my first left turn too soon at a stop light with the airport in the distance on my right. I knew there was a stop light to turn onto the airport road; however, I found myself facing a power plant on a road that had no outlet. I turned around and came back down to the light to discover a no left turn sign. But if I turned right, I’d be back on the highway trailing across miles and miles of lava fields. No turnaround there. At a break in traffic, I made an illegal turn, passed the airport road stoplight, to the next, clearly marked Kaiminani Drive. One thing about Hawaii, they do a good job of signposting roads. I just had to remember to look. But as you noticed, street names in Hawaii need more than a casual glance. This is why there’s talking GPS devices. I know. But I have a Kansas sense of direction and a Kansas disdain for someone telling me directions. I never use the talking feature. The voice annoys me in the same way my mother became annoyed at the voices reading audio books. She was very particular about pronunciation. So okay. I’d made the first successful turn and drove up past newer housing areas. Why anyone would want to live where the vog (Hawaii’s version of smog) from Kilauea’s frequent outbursts covers the area in a smelly blanket, I had no idea. Possibly for the ocean view on the rare clear days. This mountain ridge was the same ridge I looked for as soon as I deplaned at the airport, a touchstone for home, but I’d never thought to wander up. Kaiminani Drive climbed and trees began to replace the lava fields. I wasn’t sure how far I’d have to go, phone maps, especially while driving, are a little too small for much detail, but I kept going and my little blue triangle followed. At the top of a steep incline, a stop sign and a street sign: Mamalahoa Hwy. Time to turn right. So far, so good. Now all I had to do was find Kaloko Drive (click for map) which I, of course, passed the first time and had to find a place to turn around, notably on a very steep downhill driveway that predicted disaster if I wasn’t careful. I was careful. And made a left turn through a break in traffic and found Kaloko Drive. Thus began the switchback drive up the mountain. I wish I’d thought to turn off the phone maps and turn on the camera as I drove up the road, but I didn’t. 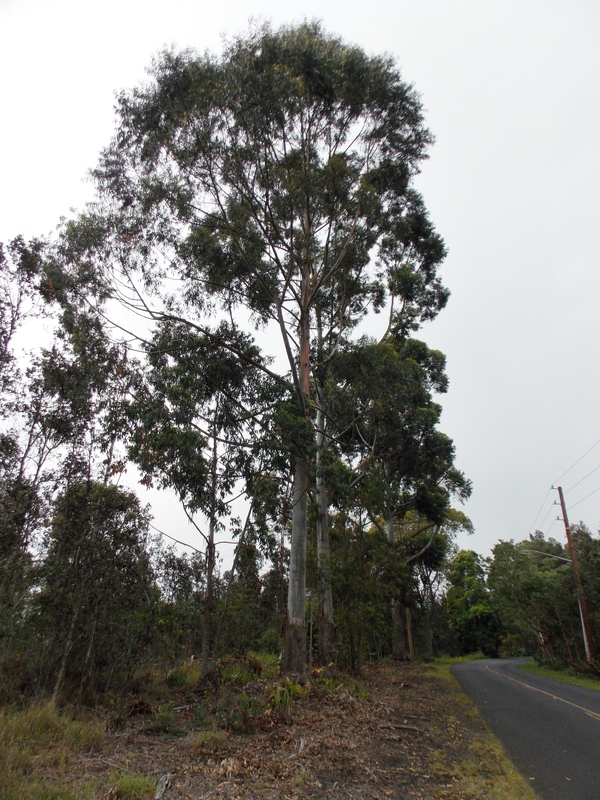 A rain forest, much like the North Kohala forest above Waikaloa Valley, folded around the car and mist softened my journey. I knew Kaloko Drive simply ended with no outlet so I couldn’t get lost. There wasn’t much traffic. I slowed. Thick foliage filled both sides of the road, a flash of color as I passed something in bloom, a driveway back into an unseen dwelling. I drove on, curving left and right and left as I climbed the switchback. I kept looking for a sign that said Cloud Forest Sanctuary, but nothing, no cars, no people, more foliage and trees. I turned on the windshield wipers to clear clinging mist. I saw a man ahead. He swept fallen fronds back from the side of the road with a yard rake. I stopped, rolled down my window. He looked up from his work. “Hi,” I said, “Do you know where…..” A car, driving way too fast, flew around the curve above me and headed our way. The man leaned on his rake as it passed. “Pull off the side,” he said. “They drive too fast on this road. But be careful, it’s muddy, and you’ll need to back up to get onto the road again.” I looked. It was muddy. About all I needed was to get stuck. I pointed ahead to a flat spot on the opposite side of the road. “Can I stop up there?” He nodded. I crossed the road, parked on a more solid piece of ground, and got out of the car to walk back to where he worked. He pushed his cap aside and scratched his head the way any Kansas farmer like my dad might have done. “Cloud Forest Sanctuary….no….but Buzzels now, they show people around.” He pointed down the road in the direction the speeding car had disappeared. 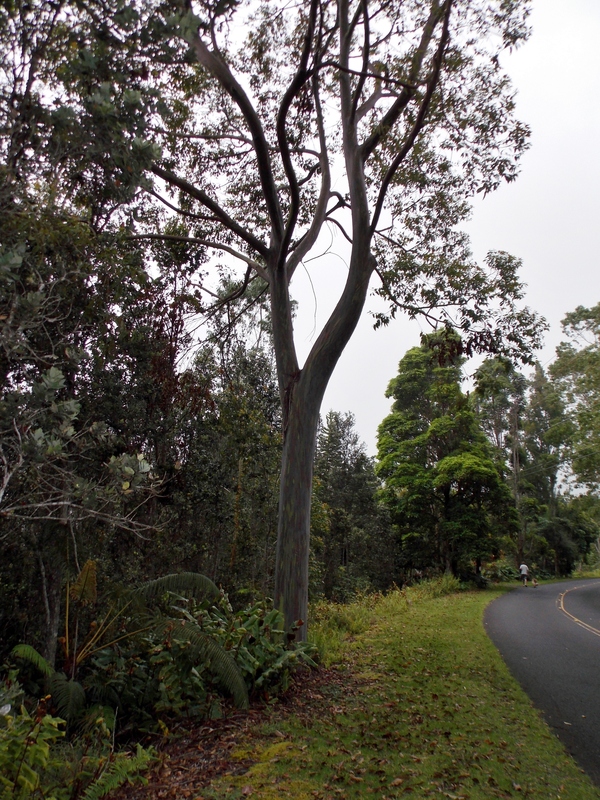 “But if you want to see a Rainbow Eucalyptus, there’s one right there.” He pointed up the road about fifty yards beyond where I’d parked. “See it?” I saw, misty in the overcast sky. “Thank you!” I went to the car, got my camera, and walked up the road. The lower part of the tree didn’t have much color, but higher, the pastel colors, although muted, flowed down the trunk. “You missed the best one,” he said when I returned to thank him. He nodded, a brief nod, again reminding me of Dad, and pointed. “It’s just beyond. Maybe ten yards.” How could I have missed it? I followed his point again up the hill, past the first tree and found the second. From a distance it didn’t look that different, except smaller and younger. Close up, it’s colors were astounding. Bright reds and blues, green, and yellow striped the trunk. The colors show up as the bark peels off and mute over time. This one wasn’t muted. The tree is a native of the Mindanao Island in the Philippines but seems to do well in most tropical areas. In Hawaii, it’s often used in building boats. If I get really ambitious, I might order seeds and turn the living room into a garden. Well, probably not. The tree grows to more than seventy feet, and I don’t really need a boat. The trip back to North Kohala was far less of an adventure, but I’d found the tree, picked up a piece of bark, and had my photos for Jessica. 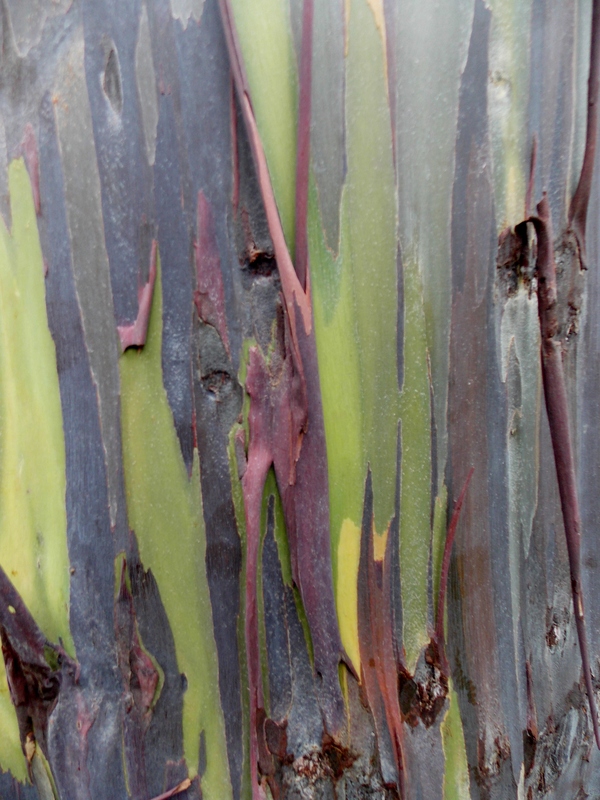 And now, for all of you, too, although searching the Internet for “rainbow eucalyptus” will bring you more information than you really want or need. Lots more glorious photos, too. But not the story of an adventure. Next Another Year, Another Memorial Day. Wow. 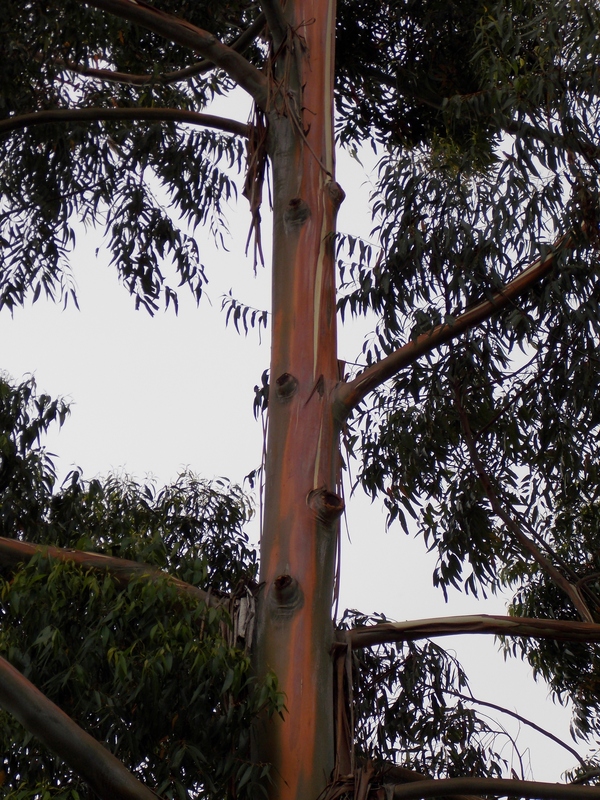 I saw some Rainbow Eucalyptus on the web, but I’m thrilled that you got to see them in person. Are they fragrant as well as colorful? What a remarkable adventure you had! Thanks for sharing it. It was fun. Thanks for reading. No, the tree smells more or less like a tree. i.e. nothing much except a bark smell. Would be appropriate though, wouldn’t it? Thanks for reading and commenting, Terry. The bark was pretty remarkable. I’m glad I saw them. On a different note, thanks for your web cam on the eagles. Yesterday I met some folk from over by Powell Gardens and they said eagles are returning to Missouri. Pretty cool.